In 2010, AN wrote about an identity theft scandal involving some high profile British architects and Chinese impostors leaving some observers at the time to wonder if starchitects like Norman Foster or Zaha Hadid might be next. It now appears the archi-pirates have indeed set their eyes on Hadid's curvaceous designs, setting of a construction race to see whether the copy-cat can outbuild the original and an international debate about intellectual property. 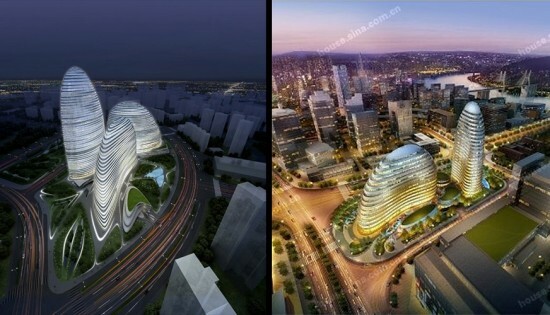 Spiegel reported that Hadid's Wangjing SOHO tower complex, proposed in 2011 for Beijing and now under construction, has been copied and rebranded as the Meiquan 22nd Century in Chongqing. When placed side by side (above), it's tough not to see the distinct resemblance. The developer of the Hadid complex told Spiegel that the clone-towers in the south of China are progressing with construction at a faster rate than the SOHO project, and could even be completed before Hadid's original, noting that even if his company prevailed in court, the offending building would likely only face a financial penalty. Satoshi Ohashi, the project architect at Zaha Hadid Architects, went as far as to tell the German publication, "It is possible that the Chongqing pirates got hold of some digital files or renderings of the project." Many are not surprised that in an age of Photoshop and digital drawing, entire architectural projects are being copied, including architects at Hadid's firm. While upset at the direct copy, Zaha herself expressed "excitement" at the idea her projects could spur mutations. New York said no, but Miami says yes. 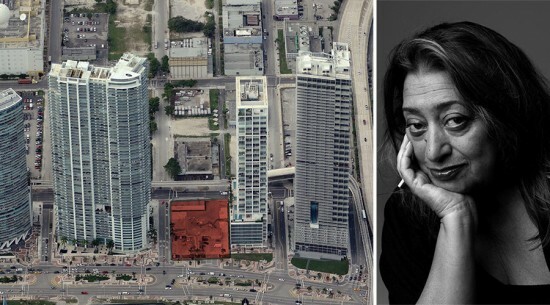 After losing out to Norman Foster to design a tower in Midtown Manhattan, Zaha Hadid has been asked to design her first skyscraper in the Western hemisphere in downtown Miami, the Miami Herald reported. No design has been released, but the new residential tower will be located at 1000 Biscayne Boulevard on the site of a BP gas station on the city's waterfront Museum Park, seen in red above. The site is part of a row of condo towers along the boulevard known as the "Biscayne Wall." Developers Gregg Covin and Louis Birdman aren't releasing details, but told the Herald the project will be officially unveiled early next year. As AN previously reported, Hadid is also building a new parking garage in Miami, which was approved for construction in November. Elsewhere in North American, Hadid is working on a dramatic house in San Diego and has been designing smaller-scale interiors and products. 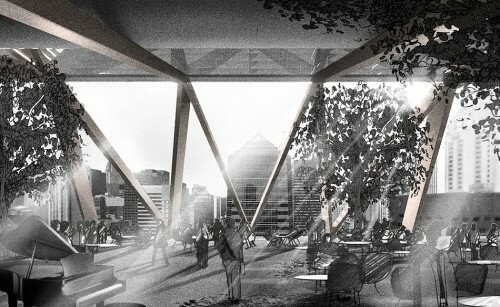 Also check out renderings of Hadid's Manhattan proposal here. “If Zaha is in Paris, ask her to text me and make an appointment.” So read the text message from Karl Lagerfeld to Naomi Campbell. La Campbell was having a sit-down with Zaha Hadid, who happens to be designing the supermodel’s new house outside Moscow. But this wasn’t a meeting to review floor plans—it was an on-the-record chat (including incoming texts) for the German edition of Interview magazine. The conversation ranged from the subject of Hadid’s new book (on the Russian Suprematist movement, one of her foundational influences) to 3-D printers. Funnily enough, Campbell covers a lot more ground than architecture writer Aaron Betsky manages in his recent and rather fluffy profile of Hadid for Glamour magazine, which named the architect as one of its Women of the Year. Here, Betsky cites Mame rather than Malevich as an early influence: “My house was like Auntie Mame’s, with my mother redecorating every season,” said Hadid. 'Tis the season for bestowing "Best Ofs", and this edition of SHFT+ALT+DEL includes some of the recent laurels laid upon architects and designers by business and consumer press... Zaha Hadid is named one of Glamour magazine's Women of the Year for 2012. (Glamour seems to have latched onto Condé Nast sibling The New Yorker calling Hadid "The Lady Gaga of Architecture...") Across the pond, David Adjaye is at the tippy-top of the 2013 Power List, ranked number one in the annual publication's list of the most influential black people of the UK. This year's Pritzker Prize winner, Wang Shu, gets tapped as 2012 Innovator of the Year in Architecture by The Wall Street Journal. South of the border, GQ Mexico named Esteban Suarez of BNKR Arquitectura, pronounced Bunker, Architect of the Year. Congratulations to them all! Meanwhile, back in the salt mines... Kieran Long, architecture critic for The Evening Standard and assistant curator for the 2012 Venice Biennale, takes up the post of Senior Curator of Contemporary Architecture, Design and Digital at the V&A museum in London. Paola Antonelli, MoMA's Senior Curator of Architecture and Design, was appointed Director of Research and Development in October. Her mission: "provide the Museum with information and critical tools to evaluate new initiatives and identify new directions and unexplored opportunities, particularly in the digital realm." The indefatigable Antonelli will divide her time between her previous curatorial role and the new position. 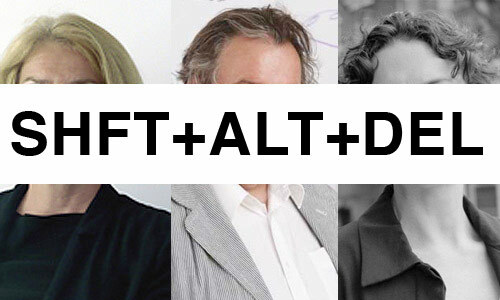 Have news on movers and shakers in the architecture & design universe for SHFT+ALT+DEL? Send your tips to people@archpaper.com! Hong Kong-based architects Kristof Crolla (LEAD) and Adam Fingrut (Zaha Hadid) married traditional Chinese craftsmanship and digital design technology in their temporary pavilion, Golden Moon, which won the Gold Award in the Mid-Autumn Festival Lantern Wonderland last month. The 60-foot-tall structure was built in just 11 days atop a reflection pool in Hong Kong's Victoria Park, proof that "complex geometry can be built at high speed and low cost with the simplest of means," said Crolla and Fingrut, who sought to rethink digital design by "anchoring the paradigm in a strong materiality." To create the "fiery flames," a reference to the Chinese legend of Moon Goddess Chang, Crolla and Fingrut began with a geodesic dome structure made from steel and wrapped it with a bamboo grid made using traditional scaffolding techniques. In this case, however, that "highly intuitive and imprecise craft" was based on an incredibly precise computer generated grid designed to install and bend the bamboo rods into a specialized structure around the steel dome. The dome was then clad with metal wire and a translucent, flexible fabric, two typical paper lantern-making materials, which were then lit up by 10,000 LEDs. The flame pattern and bamboo structure is "based on an algorithm for sphere panelization that produces purity and repetition around the equator and imperfection and approximation at the poles." The dome is wrapped with a diagrid according to a Fibonacci sequence that produces order along the equator and randomness at the poles. Simple drawings of this code were made for the construction team so they could easily mark the intersections between the steel and bamboo structures. Golden Moon is the result of research into what Crolla and Fingrut call "building simplexity," or constructing complex geometries from the simplest means. For example, optimization scripts were used to reduce the amount of fabric "flames" from 470 different units to ten that could stretch and adapt to the curve of the dome. "Preconceptions of building methods and familiar construction techniques had to be abandoned by all parties as both the digital and the material world demanded a new design and building set-up to be devised." Zaha Hadid wins again! 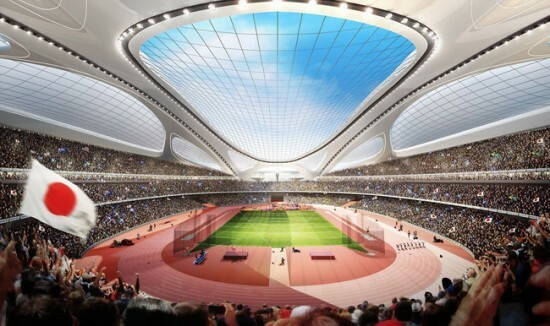 Following a star-studded design competition, the Japanese Sports Council has announced Hadid as the winner of the New National Stadium in Japan, beating out Toyo Ito, SANAA, Populous, UN Studio among others and taking home a $250,000 prize. 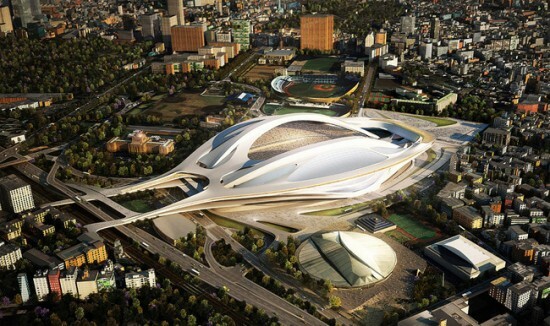 All-star designer of London's 2012 Aquatics Center for the summer Olympics and the first female to ever win the Pritzker Architecture prize, Hadid continues her legacy with this new stadium in Tokyo. Estimated to cost around $1.6 billion, the venue will seat 80,000 visitors and sport a retractable roof. Japanese architect and jury chair, Tadao Andao, commented on Hadid's fluid design as a complement to the crowded Tokyo landscape as well as being environmentally efficient and able to fit the strict completion deadline. "It has dynamism, which is most essential to sport and its streamlined shape fits its internal space. It is also new in terms of structural technology," Ando told the AFP. The stadium's smooth and sinuous white curves fall in line with Hadid's futuristic style and should play a unique addition to the city's terrain. The new structure replaces the existing 54,000-seat national stadium that featured prominently in Japan's 1964 Olympics. The new stadium will have a similar capacity as Beijing's Olympic "Bird's Nest" stadium—91,000 seats—and will feature an all-weather roof. Construction is set to begin in 2015 with a completion scheduled in 2018. Hadid's new stadium design will play host to the Rugby World Cup in 2019 and may even hold the 2020 Summer Olympics should Tokyo be granted its request to host them. After today's announcement of Norman Fosters next project in New York, a luxury condo tower at the United Nations, we just can't get enough of the British starchitect. 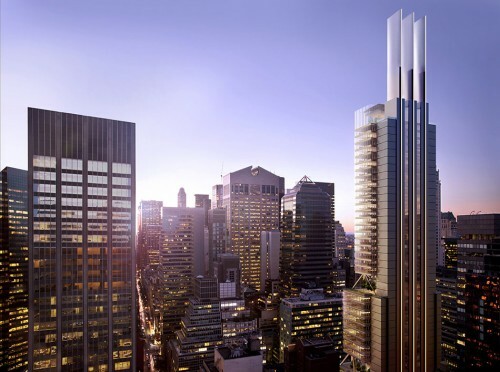 Luckily, a stash of video renderings and presentations from the firms behind the planned 425 Park tower can provide just the fix. It wasn't too long ago that the starchitect-filled competition for the new Park Avenue tower selected Foster + Partners as its winner. Now after the design presentations at the recent MAS Summit and the release of photo renderings from all players—including runners up Richard Rogers, Rem Koolhaas, and Zaha Hadid—we can indulge in the virtual demonstrations of their designs. For more videos of the MAS summit presentations, click here. Eleven finalists including Zaha Hadid, Toyo Ito, SANAA, and UN Studio have been announced for a major new stadium project in Japan. Tadao Ando, jury chair for the Japan Sports Council competition, revealed the contending designs for the New National Stadium, narrowing the field from the original 46 entries. First, second, and third place prizes were secretly selected on Wednesday, November 7th, but the winners won't be named until a ceremony is held later this month. While we anxiously await the final announcement, take a look at the proposed stadium designs by each team. Scheduled for completion in 2018, the stadium is already slated to host the 2019 Rugby World Cup and will also be offered as a site for the FIFA World Cup, the IAAF World Championships, and a range of entertainment events. The stadium could even play host to the 2020 Olympics and Paralympics if Japan is chosen as their location. Eavesdrop> Bilbao of the Midwest? If you read this column, you know Eaves loves a party. You also know we self-deprecatingly speak of mediocre Midwestern cities (we’re from Louisville). Even with summer winding down, there’s no need to stick out that lower lip. A slew of—well, ok, three–high profile openings will tickle even the slightest art and architecture enthusiast as Cleveland, East Lansing, and Cincinnati compete for the title of Bilbao of the Midwest. First up, the Museum of Contemporary Art Cleveland, designed by Farshid Moussavi Architecture, opens on October 6. Will the Mistake-on-the-Lake become the Rust Belt Riviera? On MOCA’s heels comes the Eli and Edythe Broad Museum on November 9. 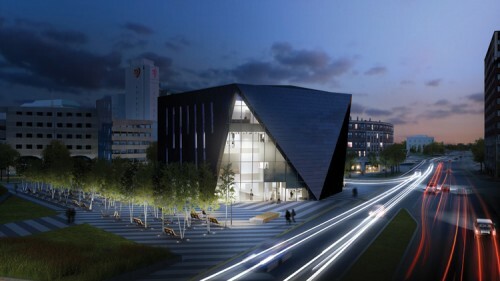 OK, we don’t know anything about East Lansing other than a school’s there, but—hey!—now they have a Zaha Hadid. And finally, Cincinnati, home to America’s first Hadid, will welcome 21c Museum Hotel by Deborah Berke & Partners. Their website says it will open late 2012. Which project will be an urban game-changer? We could be swayed by opening night invites, but right now my money’s on Cincy. Prepare yourselves Angelenos: Zaha is coming to town. Her installation Pleated Shell Structures will be on display at the SCI-Arc gallery beginning October 12. 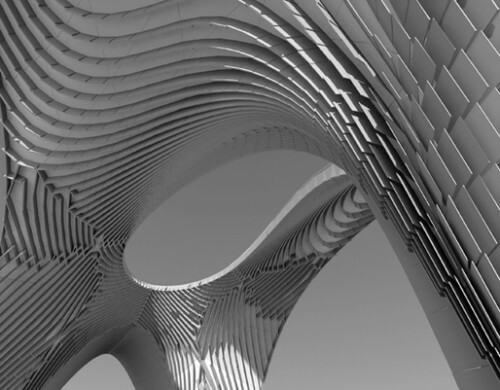 The installation's details are still limited, but it appears that it will further push Hadid's and partner Patrik Schumacher's legendary experimentation with parametric design, giving smooth forms a more tactile, imbedded surface. 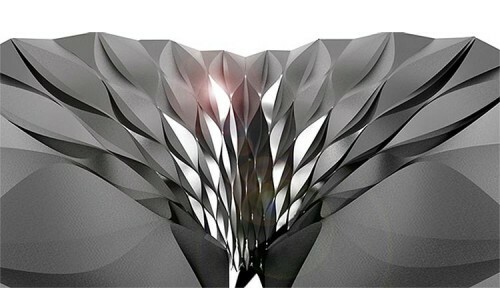 So if parametric design is 3D, could this be 4D? Which dimension are we in now, anyway?